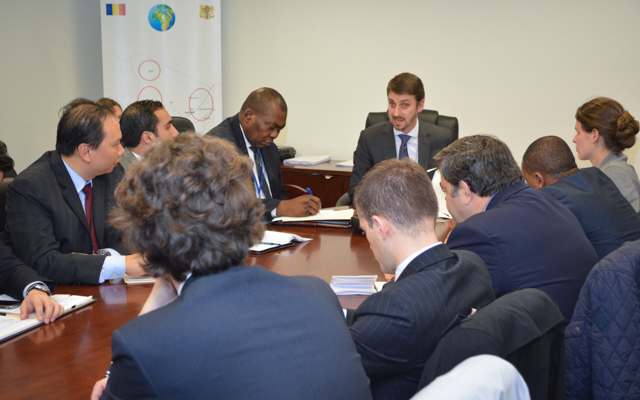 At the invitation of the Permanent Representation of the Republic of Chad, James Cockayne, Head of the UNU Office in New York, briefed Members of the Security Council at the expert level on 25 November 2014. The briefing addressed Threats to International Peace and Security: Terrorism and Cross-Border Crime, the subject of an Open Debate in the Security Council, scheduled for 19 December under the Presidency of the Republic of Chad. Mr Cockayne’s 40-minute briefing, which drew extensively on research and drafting support from UNU’s Centre for Policy Research, focused on the impact of the intersection of terrorism and cross-border crime on the Council’s conflict resolution efforts. The Security Council could initiate a formal ‘Strategic Review’ process to consider how the intersection of cross-border crime and terrorism may be impacting its conflict prevention and conflict resolution efforts, particularly in Africa, and to consider the the tools at its disposal (including peace operations, sanctions, the Council’s counter-terrorism bodies, and Article 34 investigations) for consideration alongside the report of the High-Level Panel on Peace Operations in 2015. The briefing was followed by a lively question and answer session. See the Related Files tab to download the Concept Note for the UN Security Council Thematic Debate on 19 December 2014, under the Presidency of the Republic of Chad, on Threats to International Peace and Security: Terrorism and Cross-Border Crime.